Every once and awhile, I’ll stumble over a musician or band that stands out from the saturated batch. Mando Saenz is one of those guys. Studebaker is his third solo album (first in 5 years!) and it offers the perfect blend of Americana, honky-tonk, rock and folk. Mando hails from, yes you guess it, Nashville. The land of every musician these days. But that’s not entirely true since he lived in Texas as well. Between Mando’s vocals, the twanginess of the guitar and drumming style makes me want to go out and get a cowboy hat and shoot a pistol up in the air. Of course I won’t do that though. That would be just silly. “Breakaway Speed” is a nice country song to start the album off. I dig the Male/Female singing for that one. 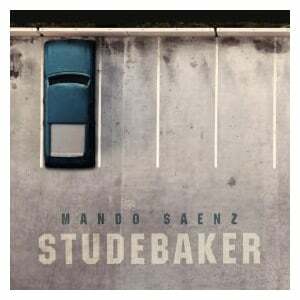 “Battle Scar” is the track that made me realize that Mando Saenz was something different than other singer/songwriters. “Pocket Change” is a awesome tune and one I could see playing over and over if I ever take a road trip in desert. The image that pops into my head when listening to that song is driving down Route 66 with a convertible as tumble winds go strolling by. That’s my favorite song on the album but just about every song off Studebaker is excellent stuff!